Well, well, well another athlete makes an insensitive, ignorant remark, and another is so thin-skinned, that it makes the news. 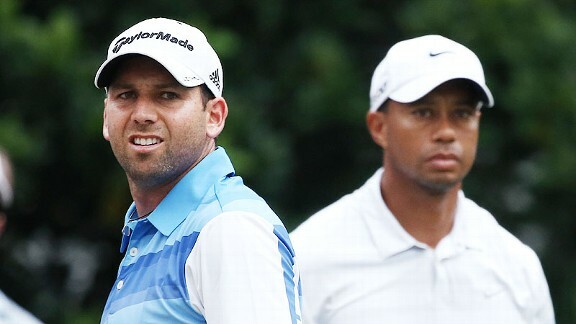 Sergio Garcia and Tiger Woods haven’t seen eye to eye for a while now, and exchanged some words a couple of weeks back during the Tournament Players Champions, when they were paired together during the third round (Tiger eventually won the tournament, while Sergio dumped two in the “drink” on the 71st hole). To which Tiger responded on Twitter in 3 separate Tweets: 1.The comment that was made wasn’t silly. It was wrong, hurtful and clearly inappropriate… 2.I’m confident that there is real regret that the remark was made… 3.The Players ended nearly two weeks ago and it’s long past time to move on and talk about golf. Garcia has since apologiged…of course he did…that’s the way our culture has evolved…say or do whatever you want…then look for forgiveness. So, how sorry is he really? As far as Tiger is concerned, he shouldn’t be so thin-skinned. He should’ve taken a high road and not commented… or joked it off by offering up a time to get together and dine. This entry was posted in Golf, PGA, sports and tagged PGA, Sergio Garcia, Tiger Woods, Tournament Players Championship, Twitter. Bookmark the permalink.